The product code for the gloves is: B6329. 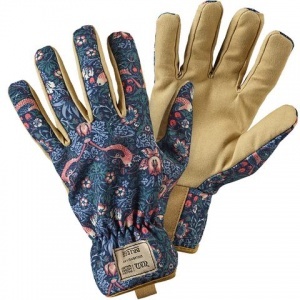 The William Morris Strawberry Thief Gardening Gloves protect hands while allowing hands to remain comfortable whether tending to plants and cultivating soils. They are constructed from soft cotton, making them ideal for wearing during long hours in the garden. The cuff of each glove also provides a more secure fit, further improving comfort and safety. The B6329 gardening gloves feature William Morris's iconic Strawberry Thief pattern, which was designed in 1883 and based on thrushes stealing strawberries from Morris's kitchen garden at Kelmscott Manor. Originally printed on expensive fabrics, the Strawberry Thief pattern can now add a touch of style to your garden attire at an affordable price. The Briers William Morris Strawberry Thief Gardening Gloves B6329 are available in a single size that should be suitable for most users. Please consult the table below for details.